The RTC 10000 must be one of the most powerful controllers for it's size and price. Totally automatic kiln firing for beginners and experienced ceramic/glass artist. Uses inexpensive K type thermocouple sensor , also available in R type. This is a very powerful panel mount controller with 8 steps each with a ramp , set temperature and hold or soak time , which makes this an ideal controller for glass work. It can temporarily show the remaining Hold or Soak time , or the remaining time in a Delay. 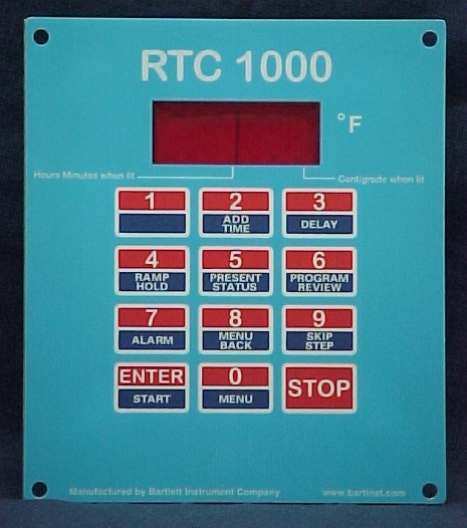 Features of the RTC 1000 include: special glass functions, add time, and edit on the fly, as well as ceramic cone-fire features; thermocouple offsets; six ramp/hold programs; zone control; add time; back key; and a recall user program to allow easier use of the controller. Cone Fire ,Preheat ,6 Ramp/Hold Programs ,Zone Control ,Thermocouple Offset . Ramp/Hold programs only (no Cone Fire features) , Jewelry Burn Out Programs . Add Time ,Back Key , Recall User Program . CONE FIRE METHOD - use when firing to a specific cone number. Available in K type For Ceramics / Earthenware and Glass work ( max temp.1150 degrees C ) . Available in R type For High Firing Earthenware / Stoneware Pottery and Porcelain (max temp.1400 degrees C). Easily to build into any existing kiln . One RTC 1000 controller can operate 3 relays , each relay can switch 2 x 25 Amp. giving you a switching capacity of a massive 150 Amp. Extra relays or heavy 30 Amp relays are available .